North Korean dictator Kim Jong Un in an undated image released by state media. The North Korean communist regime may give up its nuclear weapons, potentially bringing an end to decades of nuclear threats. 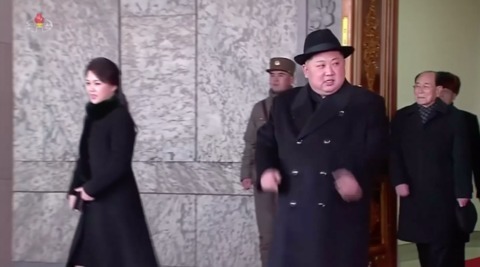 The news came out of two days of negotiations on March 5 and 6 in the North Korean capital, Pyongyang, where South Korean envoys met with North Korean dictator Kim Jong Un. During the meetings, Kim “expressed a willingness to talk to the United States to discuss denuclearization,” according to South Korean media Yonhap News Agency, which cited an official from South Korea’s presidential office. “What drew our attention, in particular, is that he made clear that achieving denuclearization is his father’s dying wish and that it has not been changed at all,” the official said. Chung Eui-yong, head of the National Security Council and chief envoy of South Korean President Moon Jae-in to North Korea, gave more details in a press conference. “The North side clearly affirmed its commitment to the denuclearization of the Korean Peninsula and said it would have no reason to possess nuclear weapons should the safety of its regime be guaranteed and military threats against North Korea removed,” Chung said on March 6, according to Yonhap News Agency. According to Chung, North Korea agreed to hold a summit with South Korea in April. Chung said Kim and Moon agreed to hold their first phone conversation before the third South-North summit. President Donald Trump marked the event in a tweet on March 6. The talks could mark the beginning of the end for North Korean provocations, which have included threats to use nuclear weapons against the United States, South Korea, Japan, and other countries. Since taking office, Trump has held a strong stance against Kim’s threats, refusing to back down, and placing sanctions on North Korea, which, in a major shift, China agreed to uphold. China began closing North Korean companies and ending China–North Korea joint ventures in September 2017. China also directed its central bank to implement sanctions against North Korea, to deny services to new North Korean customers, and to wind down loans with its existing North Korean customers. Trump was heavily criticized for his stance on North Korea, and several politicians and legacy news outlets have criticized him with claims it would provoke Kim into nuclear war. The latest developments, however, suggest the opposite. The Trump administration has expressed its willingness to hold a dialogue with North Korea, yet according to Yonhap News Agency, the White House said it will first wait to see whether North Korea is serious about denuclearization.